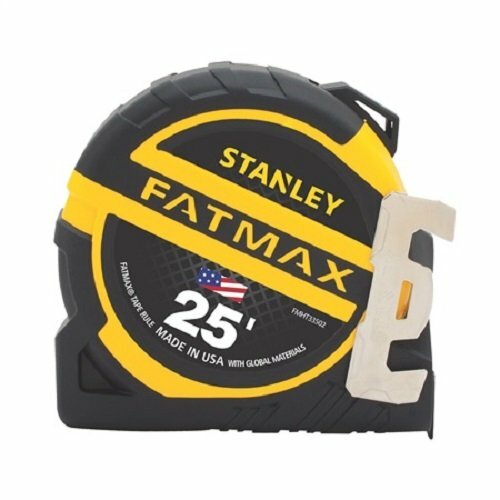 Made in New England: Stanley FMHT33502S FATMAX Premium Tape Measure, 25' x 1-1/4"
Stanley FMHT33502S FATMAX Premium Tape Measure, 25' x 1-1/4"
The Stanley FMHT33502S fatmax premium 25ft x 1-1/4 inch tape measure features increased reach and efficiency with 13' of standout on the fatmax tape measure. Professionals are able to work more efficiently because of our versatile hook attachment that is detachable and interchangeable. Our patented blade Armor technology will give our users 10x the blade life. Stud markings at 16 in, 19.2 in. Made in the USA with global materials. Backed by Stanley limited lifetime warranty.